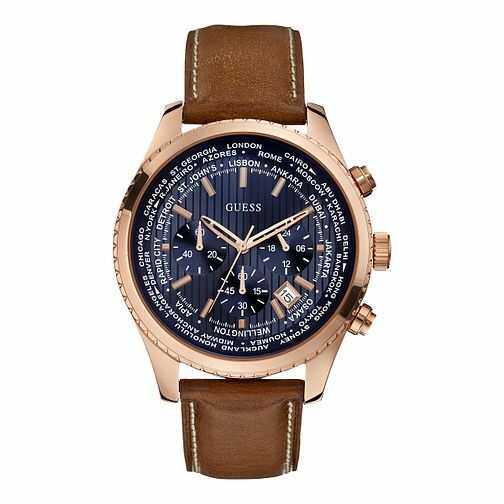 Presenting the Guess Pursuit men's watch, featuring a 46mm blue sunray chronograph dial with a polished rose gold case, date display, world time zones upon the bezel, and run with quartz movement. A honey brown leather strap completes this smart timepiece. Guess Men's Brown Leather Strap Watch is rated 5.0 out of 5 by 3. Rated 5 out of 5 by Anonymous from Beautiful watch This is a beautiful watch with a perfect sized dial for a smart/sophisticated look. Gorgeous mix of colours and the detailed dial makes you stop and stare at the watch. I got compliments from people on the piece as well. Great buy, would buy again. Guess is a well-known brand as well and has a lot of other great looking watches for both males and females.